What caused the most toxic algal bloom ever observed in Monterey Bay? In late spring 2015, the West Coast of North America experienced one of the most toxic algal blooms on record. 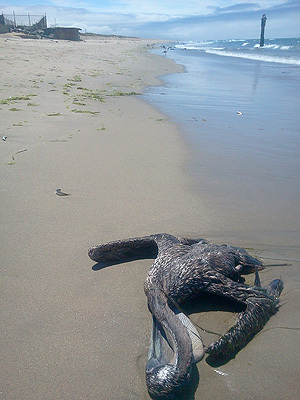 The bloom affected wildlife, including anchovies, sea birds, and sea lions, and led to the closure of commercial fisheries from California to Washington. Scientists quickly learned that the bloom consisted of diatoms in the genus Pseudo-nitzschia, but they couldn’t tell why these algae had become so toxic. A new paper in Geophysical Research Letters shows that, at least in Monterey Bay, the diatoms in this bloom became particularly toxic because of an unusually low ratio of silicate to nitrate in the waters of the bay. Some species of Pseudo-nitzschia diatoms produce a potent neurotoxin called domoic acid, which can cause seizures and death in mammals. Previous blooms of these diatoms in 1991 and 1998 sickened and killed numerous seabirds and sea lions in Monterey Bay. However researchers are still trying to figure out why some Pseudo-nitzschia blooms are more toxic than others. The 2015 Pseudo-nitzschia bloom coincided with a large-scale biology experiment in Monterey Bay called Ecology and Oceanography of Harmful Algal Blooms (ECOHAB). During this experiment, scientists from MBARI, the University of California at Santa Cruz, Moss Landing Marine Laboratories, and the National Oceanic and Atmospheric Administration measured oceanographic conditions as well as concentrations of Pseudo-nitzschia and domoic acid throughout Monterey Bay. During the ECOHAB experiment, the research team sent underwater robots cruising around the bay. Sensors onboard the robotic vehicles revealed extremely high concentrations of toxic Pseudo-nitzschia diatoms lurking below the surface. The researchers also anchored two robotic molecular biology instruments (Environmental Sample Processors, or ESPs) near the north and south ends of the bay. The ESPs confirmed that the bloom consisted mostly of one particularly toxic species, Pseudo-nitzschia australis, and that these diatoms contained unusually high concentrations of domoic acid. The result was a deadly combination: dense populations of particularly toxic diatoms. John Ryan, an MBARI oceanographer and lead author of the recent paper, wanted to know what factors affected the growth and toxicity of the 2015 bloom in Monterey Bay. Working with the ECOHAB team, he examined the physical and chemical conditions leading up to the 2015 bloom, and compared these data with conditions measured during previous years. Ryan first considered the possibility that unusually warm ocean waters might have played a role in the bloom. 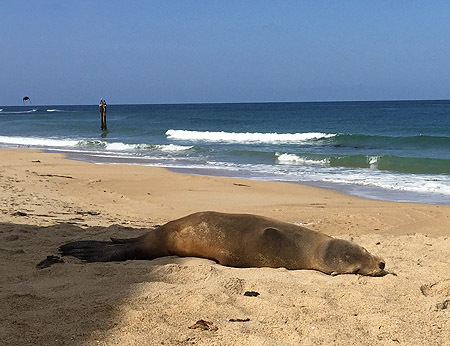 From 2014 to 2016 the surface water in the Northeastern Pacific was much warmer than usual–a phenomenon nicknamed the “warm blob.” But after comparing 2015 conditions with historical data, Ryan found that the waters in Monterey Bay were not unusually warm during the bloom. Warm water did affect the bay before and after the bloom, but during the spring of 2015 the waters were cooled by local upwelling. Upwelling occurs when strong northwest winds move surface water away from shore, allowing cold, deep water, rich in nitrate, silicate, and other nutrients, to rise to the sea surface. Because these nutrients act like fertilizer for marine algae, upwelling events often lead to diatom blooms. Upwelling is common around Monterey Bay during spring. During the spring of 2015, a very strong upwelling event in late March initiated the Pseudo-nitzschia bloom. This was followed by several milder events that rejuvenated diatom populations while allowing the drifting algae to persist and accumulate within the bay. These physical factors helped explain the dense concentrations of algae within the bay, but they didn’t explain why these algae contained so much domoic acid. Next Ryan and his colleagues looked at the chemistry of the bay, focusing on concentrations of two key nutrients—nitrate and silicate. 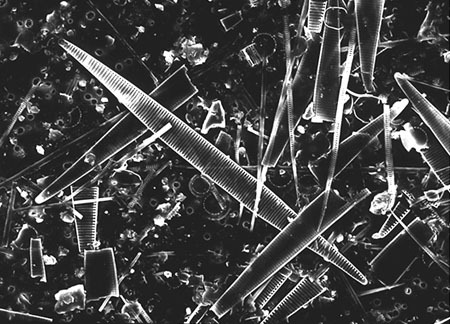 Diatoms need nitrate for a wide variety of biochemical processes, including the production of domoic acid. They need silicate to grow and reproduce. MBARI researchers have been measuring nitrate and silicate in Monterey Bay almost every month for the past 24 years. Examining this unique data set, Ryan found that, under normal spring conditions in Monterey Bay, silicate is more abundant than nitrate. However, in the months leading up to and during the 2015 spring bloom, there was more nitrate than silicate in bay waters. In fact, at the peak of the Pseudo-nitzschia bloom in May, there was essentially no silicate left in the water (presumably the diatoms had consumed it all), but some nitrate still remained. Turning to the scientific literature, the researchers found lab and field studies showing that Pseudo-nitzschia diatoms can become more toxic if they run out of silicate but still have nitrate available. Under these conditions, the diatoms can’t reproduce quickly, but they can still produce domoic acid. Diatoms reproduce by splitting in half, so any domoic acid in a parent cell is divided between the two daughter cells. But when low ratios of silicate to nitrate result in less frequent reproduction, domoic acid can become concentrated within individual diatoms. The researchers concluded that the extraordinarily high populations of Pseudo-nitzschia in 2015 were related to the strength and timing of upwelling events. But the extremely high concentrations of domoic acid were probably caused by unusual ocean chemistry—specifically a low ratio of silicate to nitrate in bay waters. Because the unusual chemistry of the bay waters coincided with the large-scale warming of the Northeast Pacific, the researchers suspect there may be a link between the two phenomena. 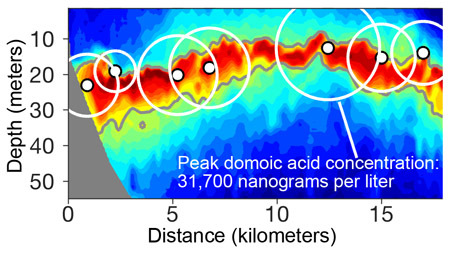 However they do not have enough data about ocean chemistry outside of Monterey Bay to flesh out this connection. Jun 5, 2017 – In the spring of 2015, Monterey Bay experienced one of the most toxic algal blooms ever. A new paper shows that this bloom became particularly toxic because of an unusually low ratio of silicate to nitrate in Bay Waters. Jun 1, 2015 - In May 2015, as part of a large-scale experiment, ocean researchers measured some of the highest concentrations of harmful algae and their toxin ever observed in Monterey Bay. May 21, 2014 – It’s now late May and the spring 2014 ECOHAB field experiment is winding down. Researchers from the University of Southern California (USC) are still conducting occasional surveys of the San Pedro Bay, but the rest of the instruments have been recovered.